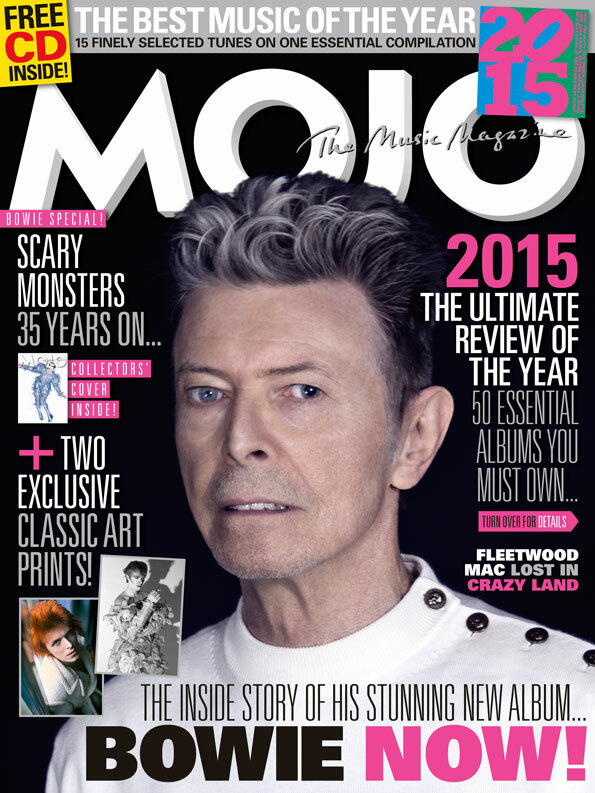 The new MOJO magazine is a must-have for admirers of David Bowie. The cover story is the exclusive inside skinny on his new album, ★ (Blackstar), backed up with a 35th Anniversary celebration of his 1980 classic, Scary Monsters, while all print issues come equipped with two fabulous Bowie art prints by celebrated portraitists Mick Rock and Duffy, all inside a posh card sleeve. Sealing the deal, it’s our annual round-up of the year's finest music, with a Best Of 2015 CD featuring top acts including New Order, Julia Holter, Sufjan Stevens and Bill Ryder-Jones, plus an in-mag rundown of all the essential albums, reissues, films, books etc. Also inside: Laurie Anderson in depth, Fleetwood Mac relive Tusk, unseen AC/DC, Bruce Springsteen replenishes The River. Plus: Billy Gibbons, Lush, Don Henley, How To Buy Ace Records, and All Back To Crosby, Stills & Nash’s. David Bowie Special PACKAGE WITH NEW ALBUM EXCLUSIVE, 2 ART PRINTS, COLLECTORS' COVER AND FREE CD The new issue of MOJO comes in a posh card sleeve, harbouring two deluxe art prints of classic Bowie shots by renowned photographers Mick Rock and Duffy, plus a specially elegant iteration of the magazine and a free Best Of 2015 CD. FREE CD! The Best Of 2015 With MOJO revealing its albums of the year – see below – this month’s 15 track, free CD features essential tracks from 2015’s essential records, including New Order, Songhoy Blues, Father John Misty, Sleater-Kinney, Julia Holter, Gaz Coombes and many more. David Bowie ★ EXCLUSIVE With his new album pending, MOJO enjoys exclusive access to David Bowie’s inner sanctum of collaborators and musicians as we tell the story of its creation, including an interview with Bowie’s trusted lieutenant Tony Visconti. Plus! Scary Monsters To mark its 35th anniversary, we unveil the inside story of the album that invented the ’80s. Albums Of The Year Our top 50 countdown of the greatest records of 2015, with input from their creators. Plus: the best in reissues, film and books while some of our favourite artists share the best things they’ve heard all year. Laurie Anderson The queen of avant-pop is discusses dogs, Arthur Russell, NASA, the CIA and more in this month’s MOJO Interview. REVIEWED NEW ALBUMS… David Bowie / Tinariwen / Tortoise / Coldplay / The Game / Wreckless Eric / Lenny Henry / Nadia Reid / Tindersticks / Jennylee / Beach House / Phil Cook / Sunn 0))) / Olafur Arnalds & Nils Frahm / Soulsavers / Teeth Of The Sea REISSUES… Bruce Springsteen / Lush / Kurt Cobain / The Velvet Underground / Duke Ellington / Ride / Buena Vista Social Club / The Kinks / John Coltrane / Simple Minds / Gary Numan / Marvin Gaye / Serge Gainsbourg / Cream… and more! Plus! Loretta Lynn makes five albums / AC/DC’s ’70s Swedish saga / In the studio with Underworld / Billy Gibbons plays with his felt-tips / Cripes! Danger Mouse reveals the records that blow his mind / Don Henley on the Eagles smash he wishes he could re-record... and much more!